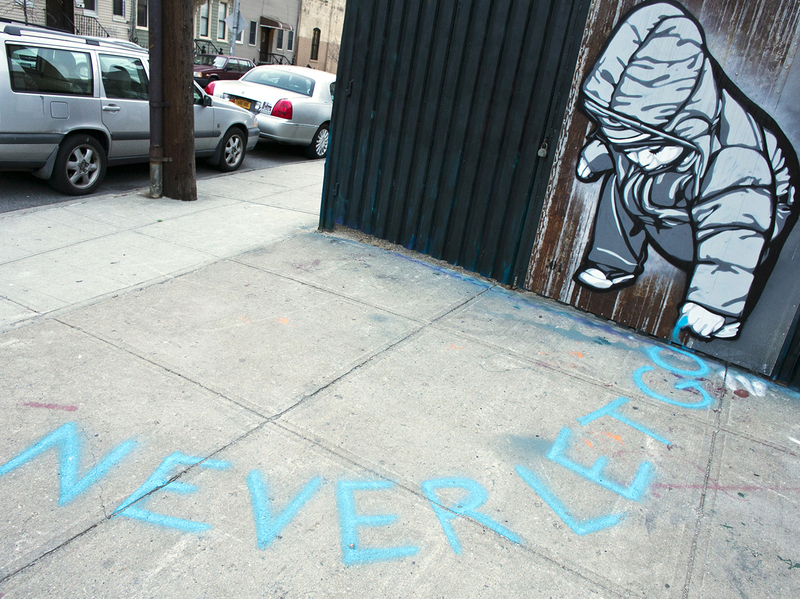 Street art was born in NYC during the 1970s, a time when the city was bankrupt and wracked by crime. Almost as a response to the chaos, young kids from the Bronx and Brooklyn began bombing subway cars and buildings with graffiti tags. It was an illegal and sometimes dangerous activity, but it created an art form that would spread around the world, and find its way into NYC galleries and museums in NYC. Since the days when President Ford told New York to drop dead while the Bronx and Alphabet City were burning, Manhattan has become a haven for billionaire financiers and foreign oligarchs whose real estate investments have jacked up rents to the point of making the five boroughs unlivable for anyone who isn’t rich, or willing to spend their entire income on an apartment. Still, street art thrives, ironically as a sanctioned activity sponsored by business owners, community groups and even developers. 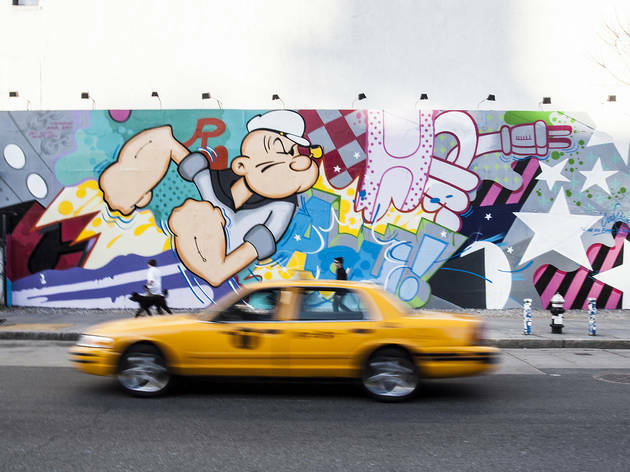 But don’t worry: It’s still imbued with the same panache and attitude that made it so compelling back in the day—as you’ll see by checking out our list of the top 13 spots to see graffiti in NYC. Street art isn’t usually preserved under Plexiglas, but Hammer Boy by Banksy is an exception—one you might expect for an artist whose pieces have fetched a million dollars at auction. Another distinguishing factor for Hammer Boy: It’s located on the Upper West Side, a tony nabe that isn’t know for graffiti murals. Located on the exterior wall of a DSW store, Hammer Boy first appeared in 2013, and the building’s owners knowing an attraction when they saw one, moved to protect it from vandalism and the weather by bolting a Plexi sheet over it. 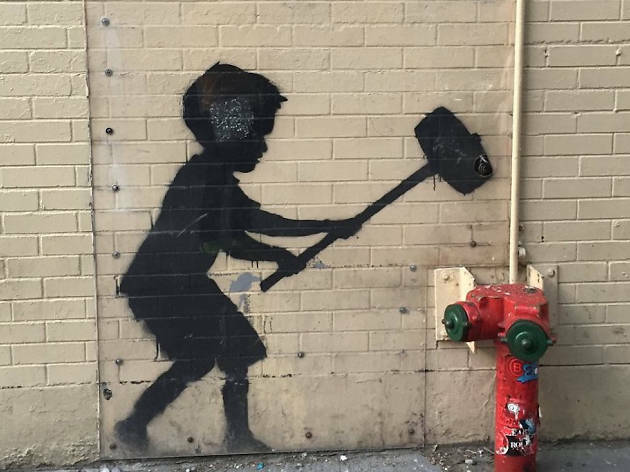 The subject is typical Banksy—a silhouette of a kid with a sledgehammer who appears to be banging down on an actual fire hydrant in front of the wall. 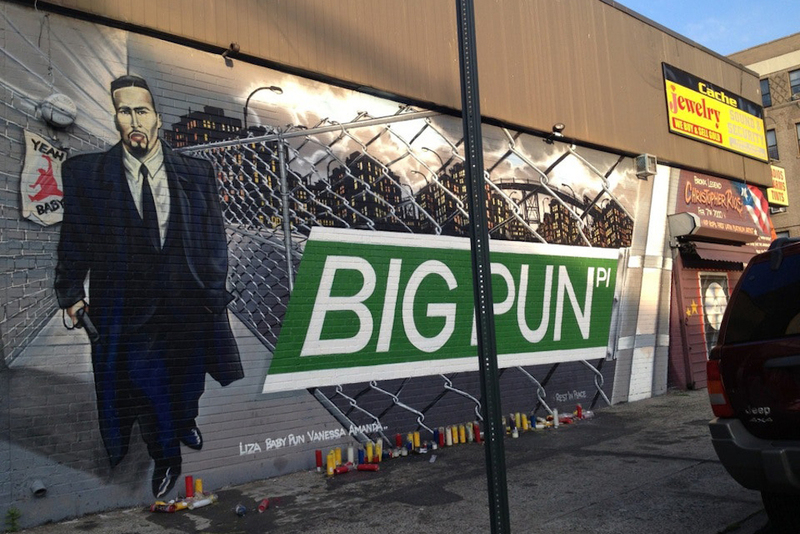 This tribute to the beloved Puerto-Rican rapper Big Pun (aka Big Punisher, aka Christopher Lee Rios) who passed away in 2000 was created by Bronx-based graffiti artists Tats Cru, and gets repainted annually on Pun’s birthday, Nov 10. 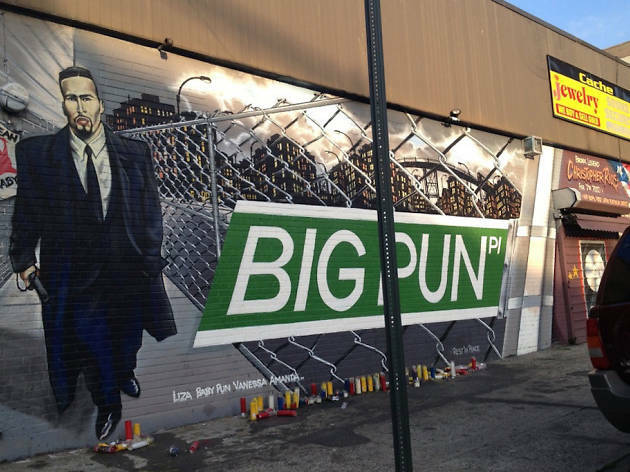 It’s a fitting reminder of the deep ties between the community and Pun, who was the first Latino rapper certified platinum as a solo act. The Audubon Society has been partnering with the Gitler &_____ Gallery in Hamilton Heights to commission street art murals around Upper Manhattan dedicated to birds threatened by climate change. Their fine feathery plumage makes for eye-popping images, and you can find out where to see them by downloading this map from the project’s website. 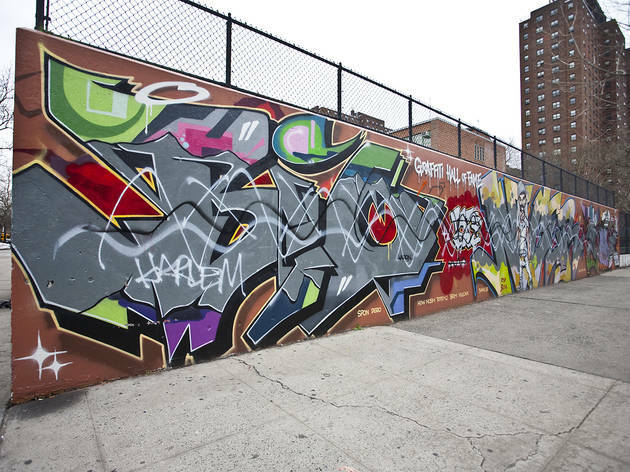 This epic South Bronx block is only unofficially dubbed the Wall of Fame. That’s too bad since it could benefit from landmark status; plans are afoot to raze this community beacon in favor of affordable housing. The wall’s pedigree is indisputable: Late Queens legend Iz the Wiz, Long Island’s Phetus and L.A.’s MSK crew represent a tiny fraction of the artists who’ve painted remarkable wild styles, fills, murals and messages across its bricks. The clock is ticking for you to see history before those bricks come crashing down. Keith Haring first splashed this wall in 1982, and it’s been a destination ever since. In 2008, it went somewhat legit when late real-estate man Tony Goldman took over the location, and began inviting street art talents such as Os Gêmeos, Shepard Fairey, Lady Aiko and more to rotate murals. 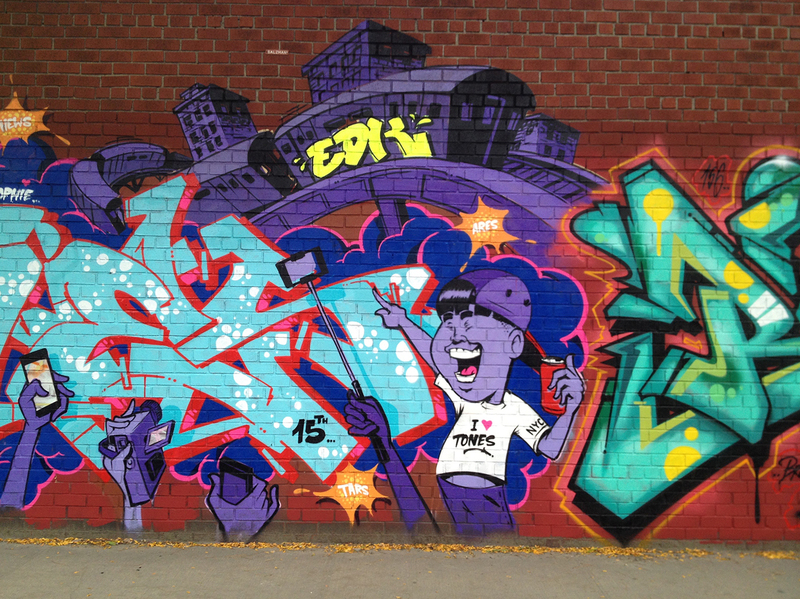 Now a serious artistic showcase, the wall is remains steeped in street cred. It doesn’t get more quintessentially New York than this outdoor exhibit on a wide stretch of East Harlem wall (yes, right by BET’s former residence). Back in 1980, neighborhood activist “Sting Ray” Rodriguez founded the Hall as an outlet for positive expression and more than three decades later, hundreds of boldfaced names— Dez, Crash, Flight, Delta, Tats Cru and Skeme to name but a few—have left characters, tags and pieces. Veteran artist Joey TDS still organizes the annual event that paints over the old pieces (Aug 25, 26 noon–8pm). 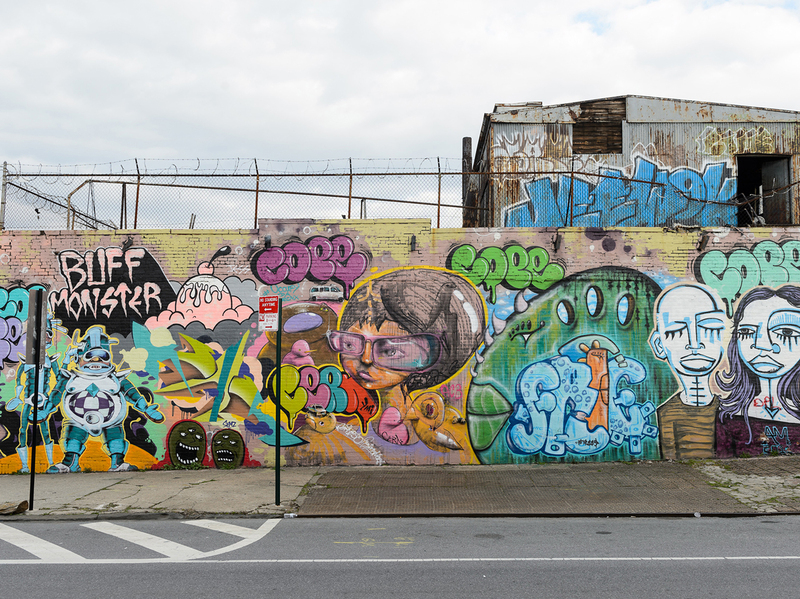 This industrial block in Bushwick offers prime wall space for street artists from around the world including right here in NYC. A stroll past the warehouses along the avenue might lead you past colorful murals by the likes of Rime (aka Jersey Joe), Swiss artist Tones One and Host 18. 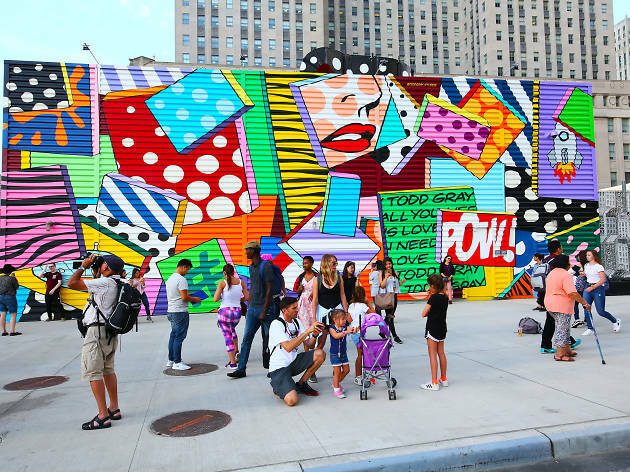 If you need additional proof that street art has gone legit, look no further than these eye-catching murals painted on a metal shed covering the foundation for 2 World Trade Center—the future skyscraper that will rise on the site in the next few years. 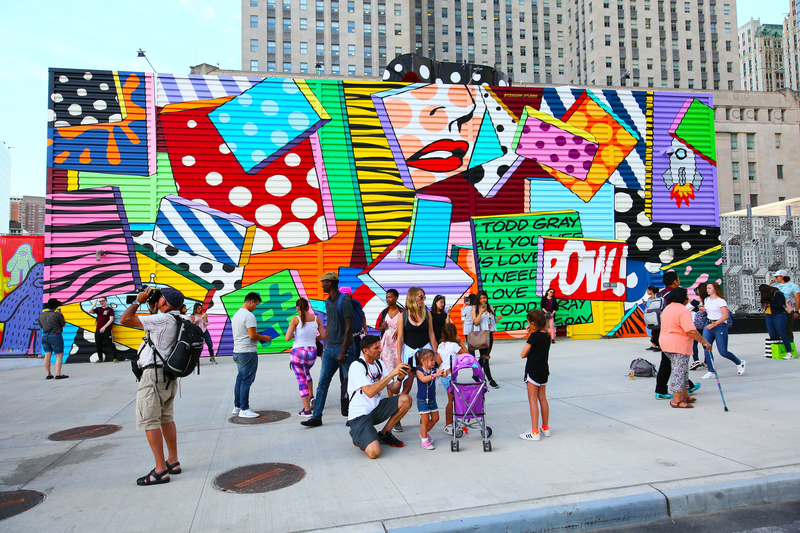 Artists Todd Gray, Hektad, BoogieRez, Stickymonger, and husband-and-wife duo Chinon Maria and Sebastian Mitre, have covered the structure in bright images inspired by Pop Art and anime, creating a welcome oasis of color in an area (the Financial District) where the palette is, to put it mildly, muted. 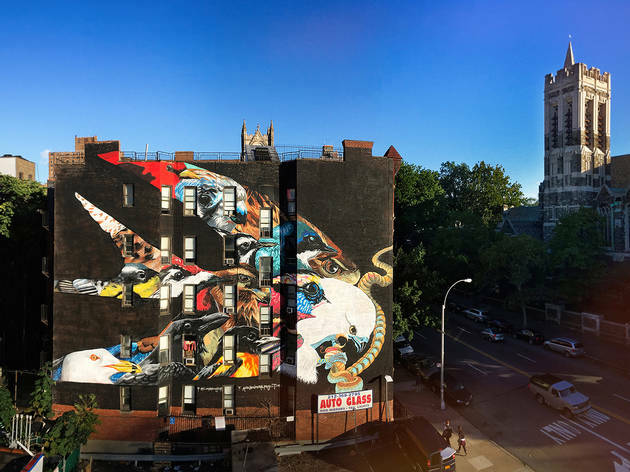 Longtime Bronx trendsetters Tats Cru (Bio, BG183, Nicer, How and Nosm) found their latest ripe facade in 2008 and invited, among others, old friend Goldie, U.K. stencil pioneer Nick Walker, L.A.’s reputed Seventh Letter crew, Crash and Evoke to paint. Out of respect for the building’s owner, they avoid carving, wheatpaste and overt politicizing, but anything else goes. Check Facebook for their next big artist gathering and perhaps an eventual contribution from original Tats collaborator Fat Joe.